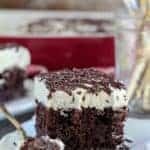 Mocha Cake – A chocolate and coffee flavored cake that is poked, drenched with a creamy mocha filling, and finished with espresso whipped cream. Moist and spongy and loaded with coffee flavor, this cake is for all you coffee lovers. I’m bringing new meaning to the term “coffee cake.” This cake is filled with actual coffee – three layers of it! Coffee lovers, settle in. This one’s for you! It is no secret that I love coffee. I especially love iced coffee. 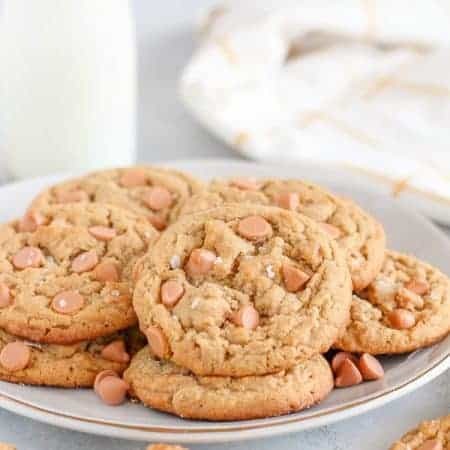 I sip on it first thing in the morning, I’ll bring it along in the car when I’m carting my kids around town, and when it’s time to sit down at the computer to share recipes with you, I always have a glass of iced coffee within arms reach. Iced coffee is now easier than ever! International Delight is making iced coffee convenient with their ready to drink iced coffee now available in the refrigerated tea/juice section at Walmart (see more below). 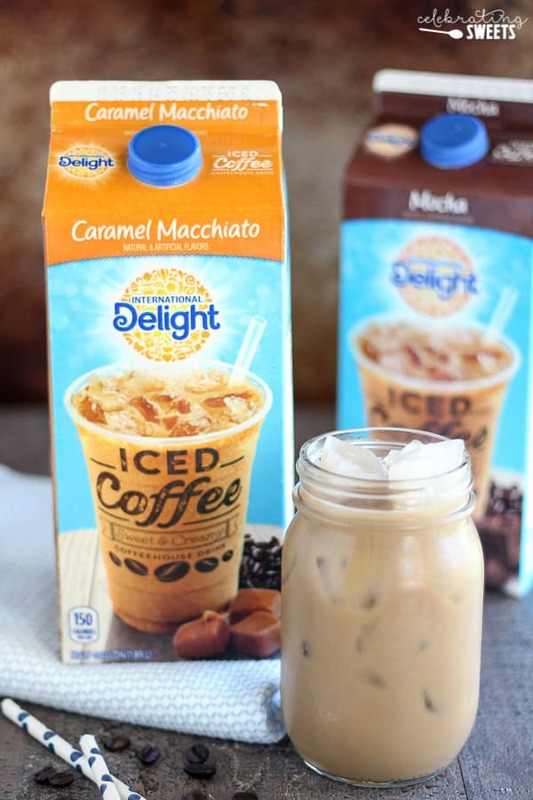 International Delight’s Mocha and Caramel Macchiato Iced Coffee is affordable and easy – all you do is open and pour! 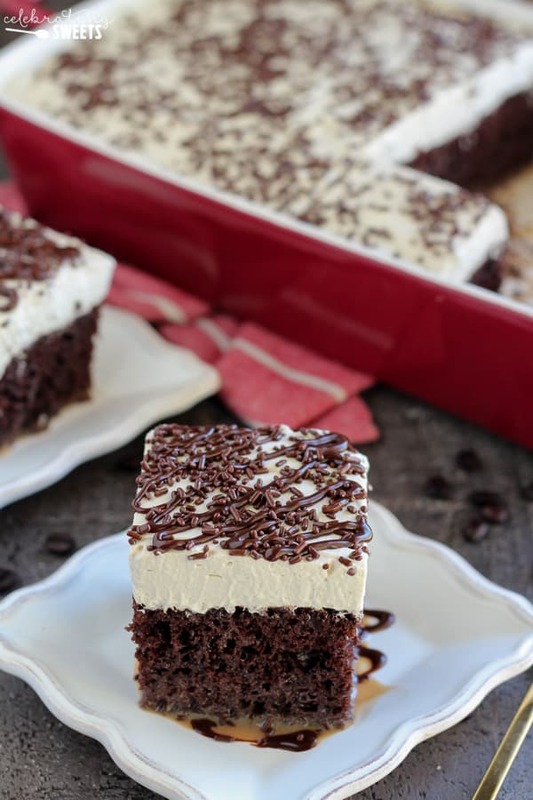 It’s also great to add to recipes, which is what I did with this delicious Mocha Poke Cake. Let me paint a picture for you. We start with a simple boxed chocolate cake mix. 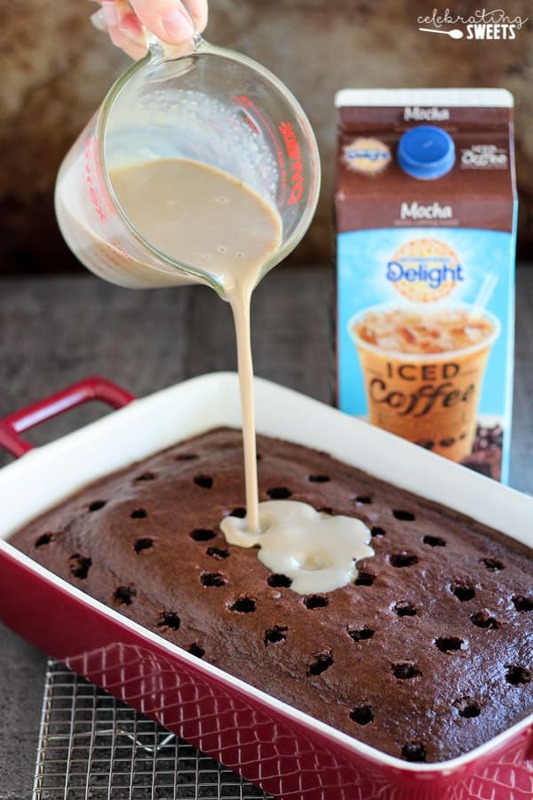 When preparing the cake batter we are going to swap the water for International Delights Mocha Iced Coffee; this will add the perfect chocolate-coffee flavor to our cake. After the cake is baked, we’re going to poke it and then pour over a mixture of sweetened condensed milk, espresso powder, and more International Delight Mocha Iced Coffee. Then, for our third layer of coffee goodness, we are going to top the cake with espresso whipped cream. 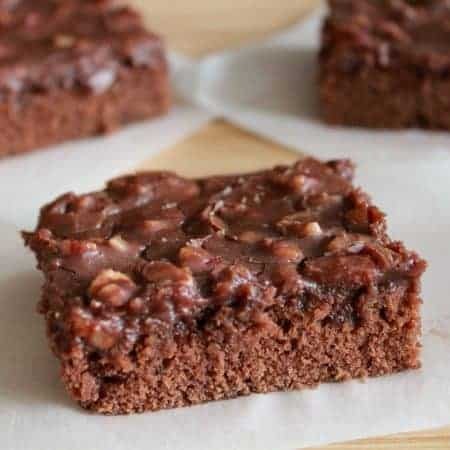 This cake is moist and spongy and it’s drenched in that luxurious chocolate-coffee mixture. 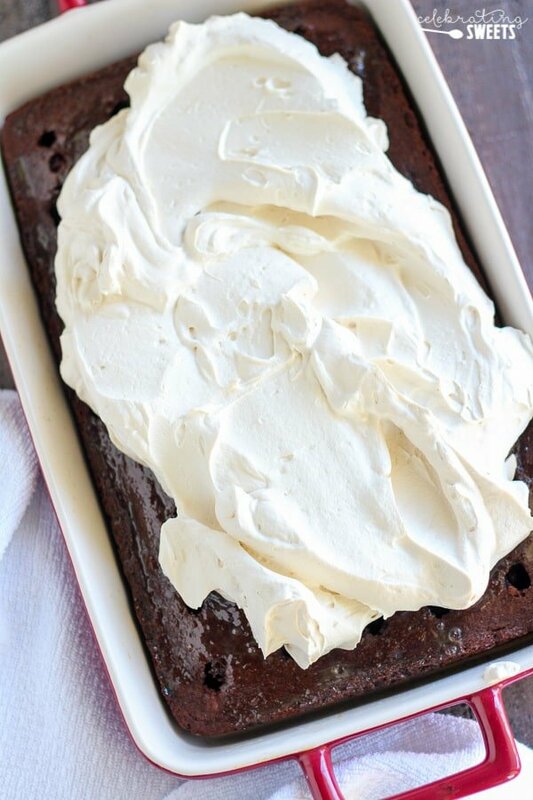 The cake practically melts in your mouth, and that light-as-air espresso whipped cream is the perfect compliment. Now, what’s left to do? Your coffee loving self with thank you. 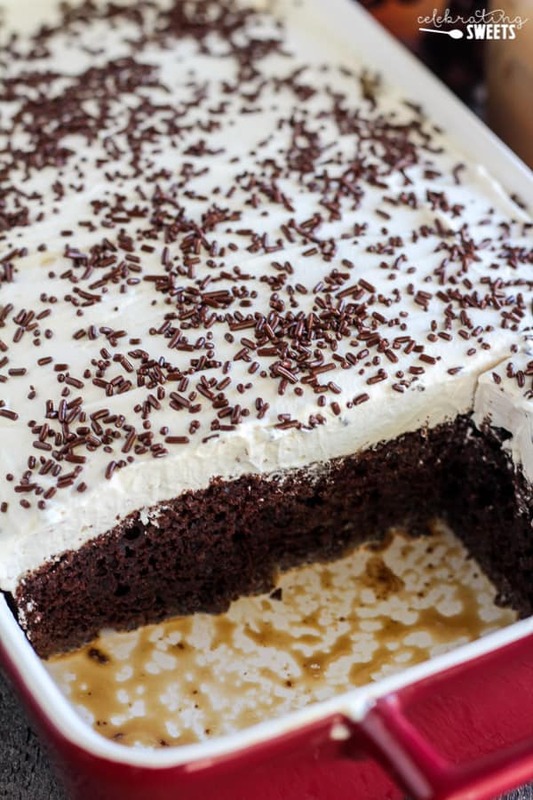 This Mocha Poke Cake recipe was created as part of a shop compensated by Collective Bias, Inc. and its advertiser. All opinions are my own. 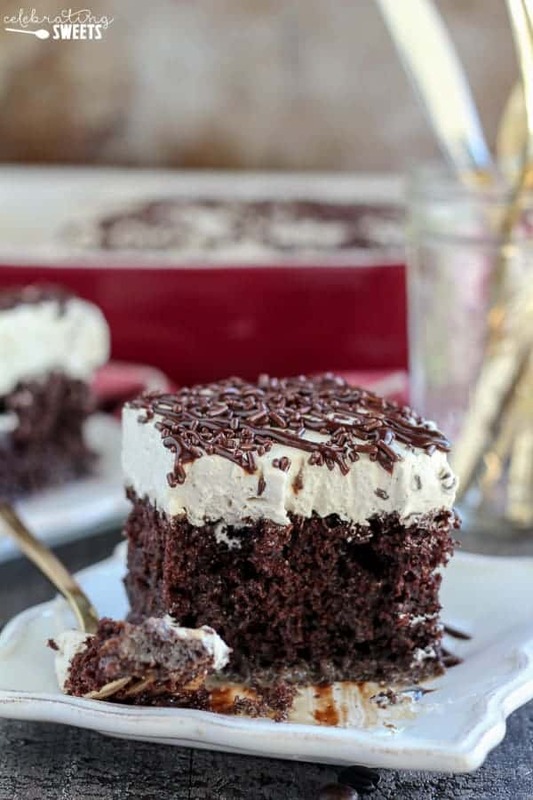 A chocolate and coffee flavored cake that is poked, drenched with a creamy mocha filling, and finished with espresso whipped cream. Moist and spongy and loaded with coffee flavor, this cake is for all you coffee lovers. Preheat oven to 350°F. Prepare the cake mix according to the box directions but swap the water for an equal amount of International Delight Mocha Iced Coffee. My cake mix called for 1 1/4 cups water so that is how much Iced Coffee I used. Stir 2 teaspoons espresso powder into batter. Pour the batter into a greased 9x13 pan. Bake according to package instructions, about 30 minutes. Allow the cake to cool for 10 minutes. Meanwhile, prepare the filing. Whisk sweetened condensed milk, 1/2 cup International Delight Mocha Iced Coffee and 1 teaspoon espresso powder. Poke the cake all over with the back of a thin wooden spoon. Pour the condensed milk mixture evenly over the cake, allowing it to soak into the holes. Let the cake cool to room temperature, then cover and refrigerate until chilled. 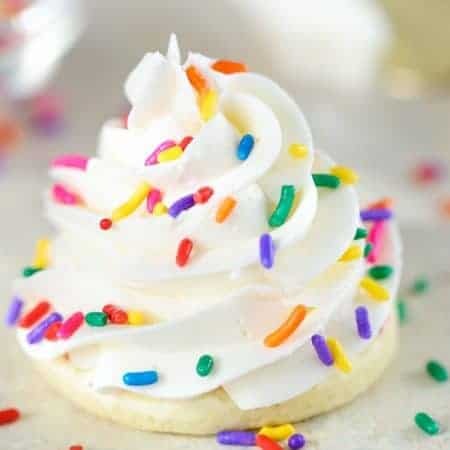 Using a hand mixer or stand mixer fitted with the whisk attachment, whip heavy cream, powdered sugar and 2 teaspoons espresso powder until stiff peaks form. Spread over the cooled cake. Top with sprinkles, mini chocolate chips, and/or fudge sauce. You're going to swap the water needed to prepare the cake mix for an equal amount of International Delight Mocha Iced Coffee. My cake mix called for 1 1/4 cups water, so that is the amount of International Delight Mocha Iced Coffee I used in the cake itself. If your cake mix calls for a different amount of water, adjust the amount of Iced Coffee accordingly. I like to store this cake in the refrigerator. I’m so happy to hear that. Thanks for the star rating, and kind comment.